It is expected that you have setup the Test Environment before proceeding to this step, and have taken into account all the recommendations cited in the documentation for test environment setup. For the sake of clarity & context, below call-out is being repeated. Let us now run a cycle to emulate the Referral Workflow for your ideal user. Ensure you’ve logged in with a valid email ID (or whichever login credential prompted by the app). Remember that this Login ID is the primary index for all your user relevant searches on the Influencers tab under Analytics section. You shall see an increment in the Invites count for Device A, under the Influencer section in Analytics. Below steps will help you get there. Against the Device A user in the Influencer tab, validate that there is a unitary increase on the Invites sent by the user. On Device B, click or act upon the Invitation Link sent from Device A. This action should redirect you ultimately to the Play or App Store, prompting you to download the app. Against the Device A user in the Influencer tab, validate that there is a unitary increase on the Clicks sent by the user. You should also check on the attribution of the Link Click. This is the most accurate level of analytics you can check your integration on. This should correspond to the Device B‘s details i.e. same model, make, IP address, closest timestamp, etc. The timestamp would actually correspond to whenever the Link was clicked upon. Make sure that you validate the timestamp against all the data you have checked above. These timestamps are in UTC, so be wary of that too. Now install the Test App on Device B. This new install is not attributed to the referrer yet. To do so, there are two possible ways depending upon the type of attribution setting configured for your app, which are either by using the Install Referrer Broadcast for Link based attribution or by submitting referral code for Referral Code based attribution. You can also use both of them if your app is configured for Link + Code attribution, so that referral code could be used for attribution in case the Link based attribution gets failed for some reason. Following is the detail for each type of attribution setting. When the app is installed after clicking on the referral link, the Google Play Store would fire the Install Referrer broadcast for the app, sending the referrer data as part of the Intent extras’ with the broadcast, which will be received by the Broadcast Receiver inside AppVirality SDK and the referrer data would be sent to the server post SDK initialization. To make AppVirality’s Broadcast Receiver receive the Install Referrer broadcast, you must declare it inside your app’s Android.Manifest.xml as shown here. Now, in normal case when you will install the app from Google Play Store, it will fire Install Referrer broadcast but while testing your app you can simulate the same using the following ADB command for sending the broadcast. - adb shell am broadcast -a com.android.vending.INSTALL_REFERRER -n <your-package-name>/.<com.appvirality.AppViralityInstallReferrerReceiver> --es "referrer" "avclk=9480n-bigb175"
Ideally, if you had configured the Welcome Screen – it should appear right here. It is a good way to prod the user towards making the signing up activity. This would look something like as shown in the image here. If you have setup a referral campaign to be driven via a Referral Code, you would need to add the referrer’s Referral Code i.e. Device A‘s referral code right here. You shall see an increment in the Installs count for Device A, under the Influencer section in Analytics. There would also be additional insights under Friends’ List, Rewards, Events, etc. From the dashboard, go to the Analytics section and navigate to the Influencers tab. !!! mind you – not the latest to be invited !!! Cross check if the Install event has been registered here for this device. 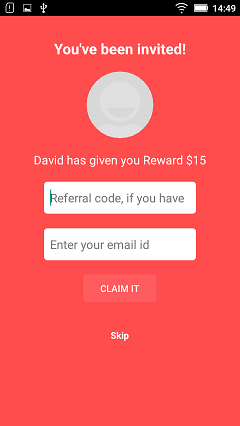 If your reward rules(defined in your Campaign Setup page) had any reward for either of the user type (Referrer or Friend) upon Install event, check that the respective user has received the reward. You may do so from the device info panel directly; access this via the info icon against each such user. Then, just navigate to the Rewards tab and check for the latest reward. The most common implementation process ensures that the Welcome Screen Call to Action initiates the Sign-up of the user. Nevertheless, since it is the very next in order & importance – Sign-up event verification is important now. It is expected that you have setup the callbacks for the Sign-Up activity while integrating the app. 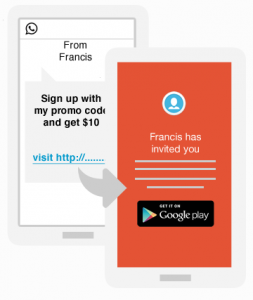 If your Campaign rules are designed to reward users (Referrer and/or Friend), then sending across the Conversion Event for a Sign-up is imperative. If you have missed it, then you shall not see rewards flowing to any of the users. In the Friend device i.e. Device B make sure the user has signed up. Like in the case of ‘verifying Install event‘ explanation previously, the foremost thing to be done is to reach the Influencers tab, immediately after you have ensured the Sign-Up activity has been completed. Find the registered email/Login ID for the Device B, and search it in the Influencers tab. Navigate to the Events tab and you should be able to see the Sign-up event registered for this user in this tab. Make a note of the timestamp(shown time is in UTC) for your own analysis. Method Two: Navigate to the Referrer Rewards & Friend Rewards tab under the Analytics section respectively, and search for the individual users using their login IDs. To avoid being repetitive, there is no separate section for verifying Transaction event. It is best advised that all the steps undertaken in Step 4 above, be applied directly to Transaction event too. Now, moving forward would imply running the same scenario against a wide range of variants, which implies the above referral flow must be validated across multiple devices – changing the stakeholders every time. Uninstall the app from the Friend device i.e. Device B, if you want to run the same device as Friend again.